Home / FAQ / What Is A Walk-in Shower? There’s a sense of delight in molding your house to fit your personal preference. By renovating certain parts of our house, by changing up its landscape, and by adding more to its design, you can make your house a place that is much closer to your heart. It becomes more than just bricks and paint, but rather a dwelling that shelters your aesthetic and your sentiment. For some, the place to start at is the bathroom. Just a small change to it can make it all the better. If you’re one such person, on who is looking to bring in a little more artistic appeal to your bathroom, then perhaps you may consider including a walk-in shower. Why should you want a walk-in shower? You’re probably familiar with what a walk-in shower is, or have at least heard of the term. If not, then no worries. We’ll fill you in. 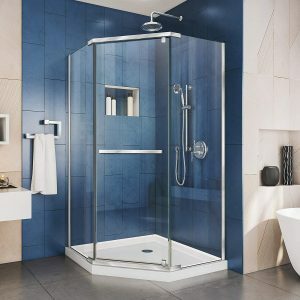 At its very basic, a walk-in shower is a shower tray that is separated from the rest of the bathroom through the use of a glass pane or thin wall. You don’t have to climb over any raised fixture or step into a bathtub. So, yes, the combination of shower and bathtub that is sometimes featured in homes does not count as a walk-in shower. For a walk-in shower, you just do as the name suggests. You walk in, onto the shower tray. Of course, the shower tray and division are accompanied by the shower faucet and the basic accessories of the shower. Often at times, the walk-in shower is located at the end of the bathroom. It’s sometimes tucked neatly within a corner or stands comfortably by the side. That doesn’t have to always be the case though. Sometimes a walk-in shower is built right in the center of the bathroom, as the focus point of your bathroom, and as a highlight of contemporary art. 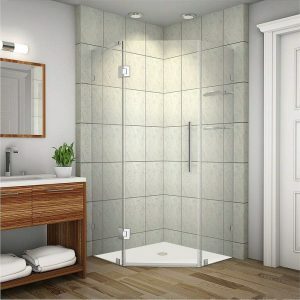 Why consider the installation of a walk-in shower in the first place? Well, there’s many reasons for just why. The design of a walk-in shower does not have to adhere to any artistic form or shape. It’s entirely your choice on how you want your walk-in shower and what look you think will best compliment your bathroom. You can even choose the material. Your shower tray can be a layout of marble tiles or a simple porcelain tray. For your division, glass would do, but perhaps you prefer wood or even granite. Perhaps not even a division in the first place, but a stone arch that welcomes you to your shower. 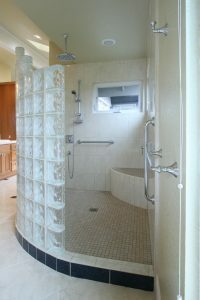 A walk-in shower is a great choice for the elderly who find it difficult to climb in and out of a bathtub. When it comes to accessibility, a walk-in shower is the way to go. Cleaning the shower tray tends to be no hassle at all when compared to other parts of your bathroom. It’s more difficult for dirt to gather or for stains to appear. Plus, walk-in showers lack shower curtains that tend to experience a build-up of mildew overtime. A great thing about walk-in showers is that they come in all shapes and sizes. Whether you live in a large house or a small apartment, just make do with the room you have. Select a walk-in shower that you can comfortably fit into your bathroom. Compared to other bathroom fittings such as shower cabinets, walk-in showers last longer. They lack doors that can wear out over time, and usually lack excessive accessories that can break or damage. If you’re convinced, and are set on installing a walk-in shower within your bathroom, then here are some suggestions. The Aston Shower Enclosure is minimalistic and simple; an ideal choice for anyone who isn’t looking for anything quirky or fancy. The glass panel is of modest thickness – 8 millimeters to be exact. The glass is tempered, making it a very easy piece to clean. The glass panel is accompanied by stainless steel hardware that is corrosion resistant. The panel comes in a number of different sizes to accommodate everyone. A very feasible item. The side panels can be installed on either the right or the left. However, the door will always come in the middle. 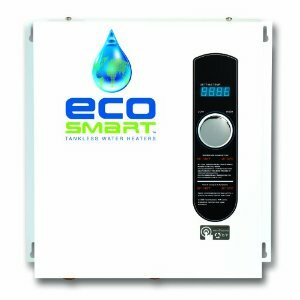 The hinges are self-closing and the enclosure is leak-proof with clear seals. You should note, however, that a shower pan is not included. That isn’t entirely an issue, though, as you can make do with the tiles of your bathroom. What’s there to say about the next entry on our list? Well, first of all, it comes in tempered glass which ensures an easy maintenance. The tempered glass is 6 millimeters thick and ANSI certified which boasts an impressive standard in quality, taking away the worry of breakage. Another great feature of this screen panel is its use of stainless steel. The glass is supported by a sturdy bar that is fitted in with stainless steel screws. The very choice in material means that the shower panel is resistant to the formation of rust and is durable. The DreamLine shower enclosure can serve as a stylish addition to just about any bathroom. The glass panel comes with a special coating that helps maintain its shine but also makes it easier to clean. It also accommodates to preference, as it features a reverse fitting. As such, it can be placed either on the right side of the shower tray or the left. The frame is sleek and polished and comes in stainless steel. Its longevity is nothing to underestimate, as it is composed of sturdy, 8-millimeter-thick, ANSI certified safety glass. In the unfortunate case that something is damaged, the product comes with a limited warranty of of a lifetime. Lastly, the item comes with a fixing kit and guide to make maintenance no issue at all.